MonkeyStyler uses a couple of heavily customised grid columns. I spent some of last week finishing off the styling for them. The whole process has taught me a lot about FireMonkey grids. Prompted by this question on StackOverflow I though now would be a good time to share some of what I have learnt. Our StackOverflow poster wanted to know how to set the alignment and color of a grid cell, so I’ll concentrate on those issues in this post. We’ll create an app which has a grid showing two columns. The first will display the row index, the second financial figures, which are right aligned and with a background which changes to red when the figure is negative. I’ll cover most of that today with the styling issues in a future post. Grids in FireMonkey are much more flexible than those in the VCL. But, of course with flexibility comes complexity. Fortunately, once you’ve learnt a few basics the rest comes fairly easy. A FireMonkey TGrid is simply a container, adapted to contain children of type TColumn. A column is simply a container for a series of cells. We’ll get to the cells later. To start with we’ll create an app which contains a TGrid. 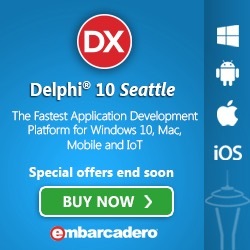 In the Delphi form designer, right click on the empty grid and select the Element Editor. Here, add a TColumn and back out. This will be a basic column in which we’ll display the row index. Data is a list which we populate with random values in PopulateData. FormCreate sets up our Data values, and also creates and adds another TColumn to the grid. We’ll create this in code so it’s easier to play around with. Note that, as always in FireMonkey, we simply assign it’s Parent property to the grid to assign it to the appropriate container. What happens here? 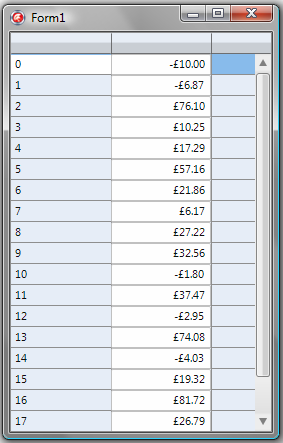 The TColumn has a number of cells to display data but it only creates as many cells as it has visible rows. I.e. if a grid has a RowCount of 100, but only 20 cells are visible then only 20 cells are created. Whenever you scroll the grid each cell gets recycled. Because of this a grid cell cannot store any data between refreshes. (Or, more accurately, it should not store data because if it does it will be displaying the wrong data). So, every time a cell is displayed the grid calls the OnGetValue event for that cell. OnGetValue passes the column and row indexes for the cell (the virtual column and row indexes) and our event handler needs to return the value to display in the Value variant parameter. (Aside: the grid appears to have a few display issues if you don’t show headers, hence why I’ve kept the headers here). Ignoring the rounding issues (we’re using Singles for simplicity here), you can see that the column of supposedly financial figures really needs to be right aligned (we’ll come to rounding and formating later). So, it’s just an edit control with the parent set to the column. Haha. Easy. To get our control right aligned we just need to set the TEdit’s TextAlign property, which we can assign when the cell is created. But we’ve now taken things as far as they can go with the built in TTextCell. It’s time to create our own cell class so we can really get things looking how we want. Look again at the definition of TColumn.CreateCellControl. Note that it returns an object descending from TStyledControl. A TStyledControl is the parent of any control which can have styling applied. In other words, any visual control in FireMonkey. FireMonkey already does that with TCheckCell, TProgressCell and TImageCell for check boxes, progress bars and images. And you can extend this to create custom cells using any control you like. You could go really freaky and use a list box or tree view within a cell. 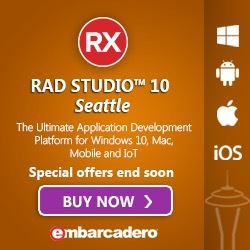 You probably wouldn’t want to, but FireMonkey is flexible enough to do it if you want. And all FireMonkey controls can own - be containers for - other controls. So you can create a cell which is made up of multiple controls. with code to set each item’s Visible property depending on the data type. But, enough showing off, lets get back to our financial column. The TTextCell is just a TEdit. Not much customisation we can do there. What we’ll do is create our cell as a TStyledControl which will contain an alClient aligned TEdit. Now, look at the SetData method, which is the Setter for the Data property. Data is defined in TFMXObject, the parent of all FireMonkey objects. Earlier we saw how the grid fetches data for each cell by called the OnGetValue event, well after it’s fetched the data it passes it on to the cell objects Data property. So, we override the SetData method to get the data we need to display. 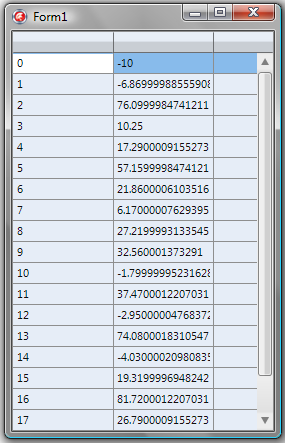 So, we have a grid column which is formatting the data how we want. This article is already long enough, so I won’t bore you any longer, other than to say that I will return at some future point to show you how you can use styles to format the grid cells we created today. GridBasics.zip - Download the project sources. Maybe it is out of scope of this blog post, but I am very curious about how to have different cell controls for different rows in the same column. Soren, I don’t know if you’re the same guy who asked the question on StackOverflow, but either way, look at my answer there http://stackoverflow.com/questions/10804977/firemonkey-grid-with-different-controls-in-same-column for details. Mike, I am the same guy and my company has decided that we will skip FireMonkey for our current project. The schedule is too tight, and I think the learning curve with FireMonkey is to steep at the moment, with the very limited documentation and samples available. The intentions with FM are truly interesting, but I’m not sure it’s quite mature yet. Thanks for your help though. I tried this method using a TCheckBox instead TEdit, it works fine, but when I close the window, appears this. Pointer being freed was not allocated. I’m adding this Check column to StringGrid connected with DBLinkStringGrid and DataSet. This sample works fine with Grid without DataSet. then I’m sure this problems appears only when I add the column in runtime to the Grid, The grid is connected to DBLinkStringGrid with a DataSet. @Arnulfo, see my email reply - sadly I have no experience with data aware controls. 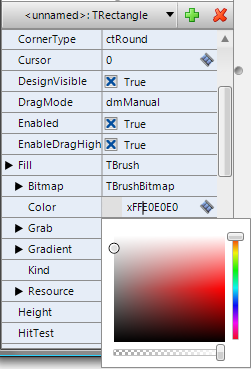 If there is a way to make this new type of column to appear in IDE’s Items Editor? I and others have investigated and I can only assume that the types of columns available in the editor are hard coded within the IDE. I found the way to make a Grid with Multiselect Rows in Firemonkey, using a new calculated field with virtual column in my DataSet, I did this on Freepascal under Mac OS with MySQl Datasets, but with Firemonkey I made some changes and it’s works. You will need to update your back end data, then call TGrid.Repaint. @Roman, The column types should be registered to the IDE as you would register a FMX component by RegisterFmxClasses (see FMX.grid.pas how it is done). TList<generic> doesn’t work in XE3 unless you include Generics.Collections. You can’t use TEdit without including FMX.Edit. I’m guessing they factored that out of controls or something in the latest. Noting that you typed the code in the protected section, the IDE didn’t create it. Putting in the PopulateData routine up front. Display issues seem to be gone when you remove headers. Now, at this point, I have a version of your code that compiles but it gives me an exception when I try to run it. The culprit seems to be the “inherited” line of the TFinancialCell, on the second calling. Drilling down, the error occurs when Delphi tries to insert the cell into the TFinanicalCell instant. I had to eliminate the OnTyping event as it appears to be gone. @Blake, did you download or cut/paste the sources? The TValue and OnTyping items I can understand, but TFinancialCell makes no reference to TTextCell, and the units you mention are already ‘used’. I’ll play with XE3 more once I’ve got MonkeyStyler out the door. I typed in and had the source at hand. Hmm, it seems there’s been some muddling with CreateCellControl definitions in the article. BTW these days I’d much rather descend the TFinancialCell from TEdit (and remove the Edit component), then change the cast to TFinancialCell. Doing that means that using the keyboard to navigate around the grid works properly and, IIRC, sorts out some issues with focusing the control/cell. CreateCellControls is not really the problem. It saves so much hassle. The only time you want to create separate controls is if you need multiple controls in one cell. is there any chance to get a c++ builder of your GridBasics.zip project? No, I don’t do C++. You’re free to translate yourself though. The concepts are the same, it’s just the syntax which is different. One more question: if at design time a prepare a grid with just two cols: string col and checkbox col, why when I check the checkbox field on a line I get all the others disabled? what about adding a callback on the column header click? More, is it possible to add an image onto the column header? This seems to lose some of the styling of a regular column. If you use the jet style - the font color seems to be lost…not sure why…there may be other style issues - not sure. My cell inherited from TTextCell. Any idea why this would happen? It sounds like there isn’t a TextCellStyle element in that style and it’s not finding the inherited EditStyle. Try explicitly setting StyleLookup for the cells to ‘EditStyle’. Editstyle messes it up quite a bit…looking in the style - there is a TextCellStyle. I even forced that style on the new column - it seems to style like the other columns - except the color of the font. I’m no style expert - I am not sure how to find the style element that is defining the font color - because when I look at the TextCellStyle - the font color should be black - but all the other cells are white…I think its losing some inheritance somewhere…Any ideas? Reading your blog has been most helpful, thanks very much. I have recently upgraded to XE4 and started using FM, but struggling to get grid cells to display independently. 2. The fonts do not change to italic or bold at all, I expected to at least get this to work! Any ideas or pointers? I’m not sure if it’s a change to XE4 that’s getting in the way, I had to make a few changes to your code to get it to compile (as noted above in a previous comment). One of your other blog posts mentioned FreeStyle, but I wasn’t sure if I understood this correctly or even if it was relevant. As you can tell, I’m stumbling a bit in the dark here, any help would be appreciated. Any ideas on how to centre stringcolumn header text? Can you help me? with how I can change the row background color in TGrid? I could not get this to work using XE5 and Livebindings to a dataset. The Grid GetValue event does not seem to get called during painting. I could not get the sub-classed TextCell to work as it gets overwritten by the Bindings Manager.